It's an odd thing walking into a comic store hoping to grab any Chris Bachalo comics that may have slipped past you, then having to decide what to grab instead when you find there are none. This time round I remembered Marvel had 'revamped' all of Spidey's main villains in the story arc The Gauntlet and thought I'd give that a whirl. Attracted by Joe Kelly's writing, I picked up the two issues regarding the rouge I never really put much thought into, yet now having read The Amazing Spider-Man 617 and 625 I can't think of anyone but. These Rhino issues are pure genius. Almost in a direct conversation with the readers to point out the absurdity of updating new rouges with old names when the original isn't broken, Kelly introduces a new Rhino, complete in true 90's comics fashion, with a massive weapon and glowing furnaces in his armour. Backed by a shadow organisation, the new Rhino wants one thing before he carries out their schemes, and that is to ascend into his title by defeating the original Rhino in combat. But there's a catch - Aleksei Sytsevich isn't who he once was. He has found Oksana, a good natured woman who has seen through his rocky exterior and convinced him of the man that lie inside the beast. 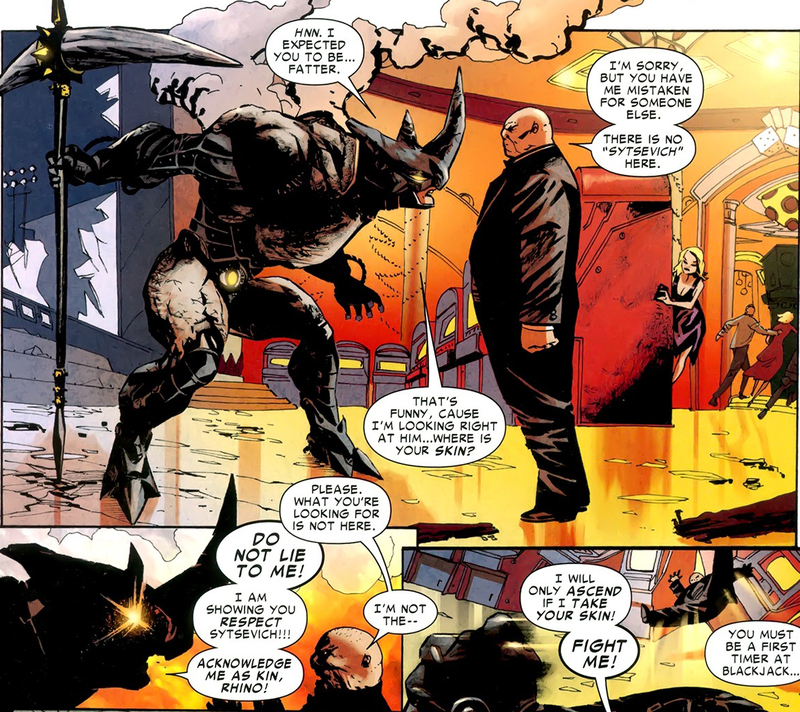 Reformed with a new job and a new outlook, Peter Parker is on hand as the two Rhinos meet. Denying his old life, Aleksei inflames the new Rhino who desperately needs him to re-adopt the role, so he can claim it from him. 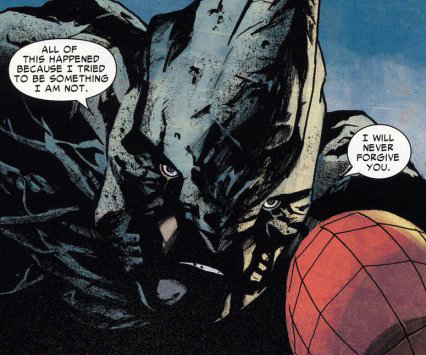 Witnessing Aleksei try to reason his way out of the confrontation, Spidey's intervention forces the new upstart to leave. As the newcomers hostile actions mount, Spider-Man convinces Aleksei to leave the Rhino suit buried and enter a relocation scheme which will grant the lovebirds a new shot at life. 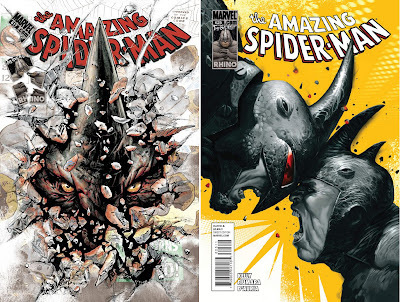 If you haven't already jotted down that you need these two issues, the art of Max Fiumara should fix that immediately. His Spider-Man is the best of recent times (he actually looks like a spider!) and he pulls off the emotional weight of the original Rhino's love and convictions flawlessly. Joe Kelly also manages to rebuild that Spidey classic of having his real world fall down around his ears as he saves the world with an optimistic wit, by having Parker search for work in part one and reluctantly join an unemployment benefit line in part two. It's classic Spider-Man with a modern twist. Shakespearian in all the right ways and full throttle in all the others, and for this wary Spidey fan who believed the franchise was on shaky ground - it's a damn solid show of faith that there's life in the old dog yet - Rhino's included. that new Rhino looks absolutely amazing! this guy's artwork is stunning. I love the way he draws the Rhino armor too (both old and new). Talk about bringing new life to an old character. Glad you guys liked Max's art style too. I love the way he has the body language of Pete match that of a spider and the Rhino with that of his namesake too! Only those covers were enough to convince me. Kind of makes sense when you think about it. You think he'd have picked up more than just a spider's strength, etc.... If it was enough to change his genetic code, it goes without saying he should have picked up some mannerisms as well. I love attention to detail like that. So do I Craig - it's great to see artists that don't just do, but think 'how?'. Apparently Aliera the first cover was available in different variants showing different stage of the Rhino busting through the cover. Now that's cool! Marvel is working very well. DC was, for many years, my favorite by far, but lately I'm liking Marvel a lot. Even for characters, I had never felt any empaty before.